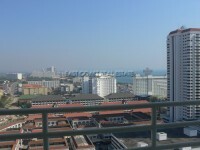 View Talay 5 is one of the best condo in Pattaya by reasonable prices. View Talay 5 has direct access to Dongtan Beach and to Tappraya road. It takes only 10 minutes by tuk-tuk to get Pattaya Center. Having the best location View Talay 5 offers rather good studio and apartments for rent. The building has 24 hour security, large communal swimming pool. The unit is available for rent fully furnished and features fitted European kitchen, air conditioning, built-in wardrobe, bathroom and balcony offering sea and sunset views.